The U.S. Postal Service has shed hundreds of thousands of jobs in the past several years, and plans to lose about 150,000 more in next few. But many postal workers face a greater threat on a daily basis: the domesticated canine. And with that in mind, perhaps USPS employees should steer clear of Los Angeles. OK, so that is not actually an option, thanks to the Postal Service’s universal service obligation. However, postal workers should approach southern California cautiously, lest they tempt fate with their oldest foe. That’s right, USPS is out with a list of the cities in which letter carriers are most likely to be attacked by a dog, and L.A. tops the rankings with 69 bites in 2012. San Antonio and Seattle tied for second, with Chicago and San Francisco rounding out the top five. The Postal Service released the rankings to kick off National Dog Bite Prevention Week. 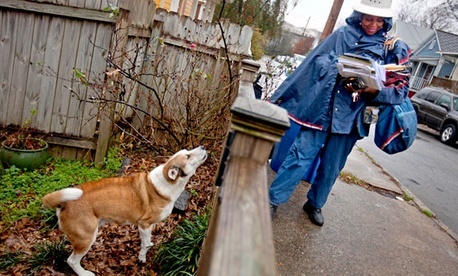 Overall, nearly 6,000 postal workers were attacked by dogs last year. USPS has a message for all dog owners, too: Keep your pets away from our carriers. “If our letter carriers deem your loose dog to be a threat, you’ll be asked to pick up your mail at the Post Office until it’s safe to deliver,” Ken Snavely, acting postmaster of Los Angeles, said in a statement.